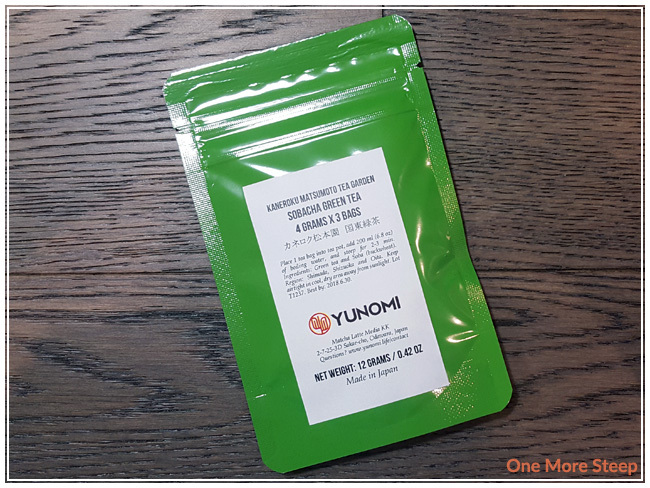 Yunomi has provided me with Sobacha Green Tea for the purposes of providing an honest review. I received the three Sobacha Green Tea sachets in a green foil resealable bag. There was 12g of tea in this bag, with 4g in each sachet. Each sachet is a pyramid, with a simple tag attached (each tag just says “tea” on it). The out side of each pyramid is covered with some fine green tea dust. Sobacha Green Tea comes from the Kaneroku Matsumoto Tea Garden, this green tea is a blend of green tea (from Shimada, Shizuoka prefecture) and soba, also known as buckwheat (Kunisake Peninsula, Oita prefecture). 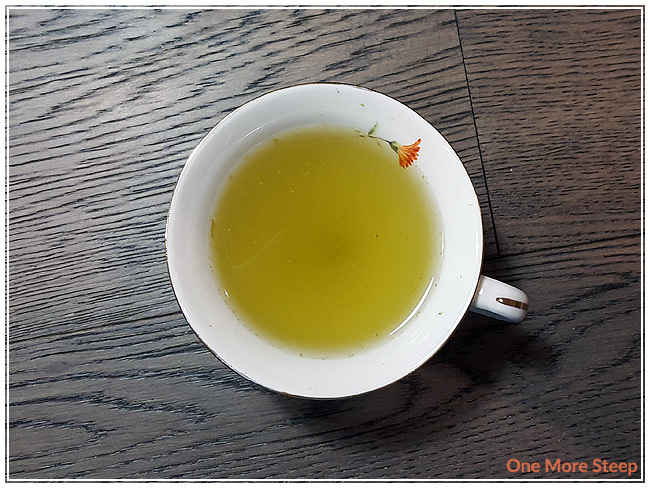 The aroma of this tea reminds me a bit of genmaicha – there’s a certain aroma that reminds of vegetation with a level of roasted nuttiness, like the aroma of the toasted rice in genmaicha. However, the roasted nuttiness is a lot mellower compared to genmaicha normally smells to me. Yunomi recommends steeping Sobacha Green Tea in boiling water (100°C/212°F) for 2 to 3 minutes. I steeped at a lower temperature (79°C/175°F) for 2 minutes. Sobacha steeps to a pale, cloudy yellow-green. The tea dust on the outside of the pyramid forms a bit of a rim on my tea cup. The aroma from my cup is that of vegetation with the roasted nuttiness again. The taste is surprisingly sweet, although not overwhelmingly so. I found that the roasted nuttiness is present with every sip, and it almost reminds me of toasted oats. The sweetness plays with the vegetal flavours, mostly reminding me of dark green vegetables like gailan or broccoli. I resteeped Sobacha Green Tea twice. The first resteep, the flavours were more towards the sweet vegetal side with less of the nuttiness from the soba. 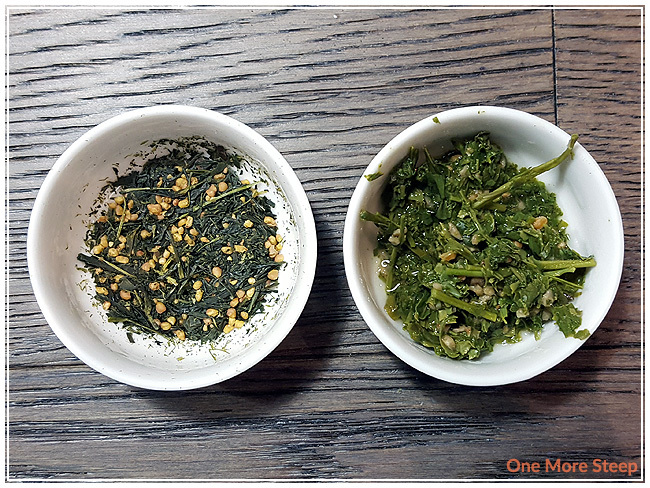 For the second resteep, the green tea base was the shining star with little or none of the soba present. That said, the green tea base is pleasant to drink so it wasn’t the end of the world. 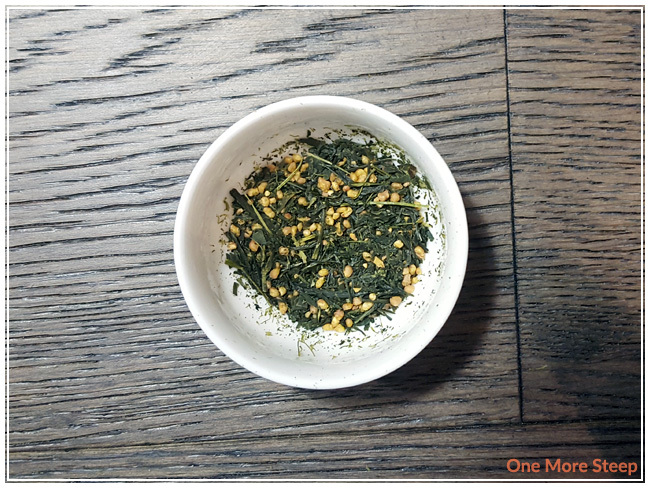 I liked Yunomi’s Sobacha Green Tea. 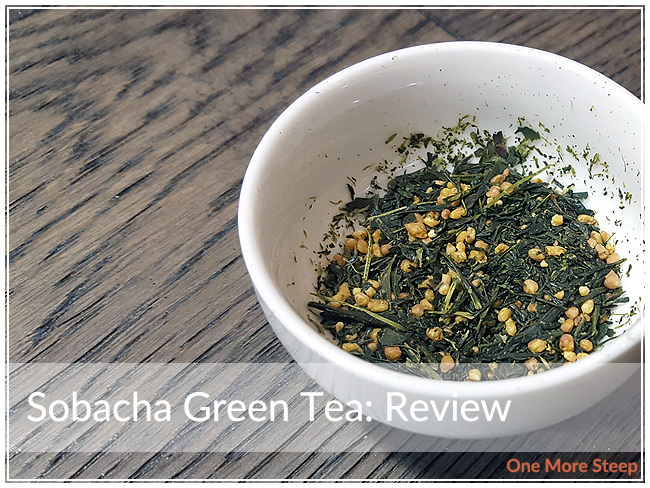 I really enjoyed this green tea blend, I thought it was a great play on the genmaicha that I’m more familiar with. The nuttiness from the buckwheat was balanced well against the sweet vegetal green tea base. I do wish that it had resteeped a little bit better, because the soba was the reason why it was enjoyable and added another level of complexity to the flavour of this tea. That said, it was still a delicious cup of tea and a tasty alternative to genmaicha.